Join us at our annual BD’s Mongolian BBQ fundraiser on Tuesday, April 5th from 6-9 pm. The money raised will go to the 2016 scholarship fund to help deserving young people pursue a STEM education. Tickets are $27 for adults, $15 for children 12 and under (tax and tip are included in the price). To purchase tickets, see our treasurer, Monique Lake, or pay for them via PayPal. 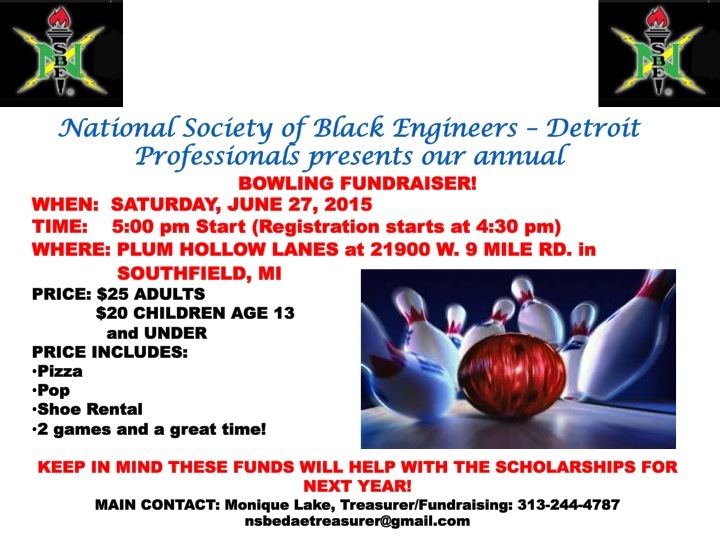 Please join us on Saturday June 27th at 4:30pm as we host our Annual Bowling Fundraiser at Plum Hollow Lanes in Southfield, MI (21900 W. 9 Mile Rd. Southfield, MI 48075)! Registration begins at 4:30pm – Game starts at 5pm Price:$25 Adults, $20 Children (13 and younger) Price Includes: Pizza, Pop, Shoe Rental, 2 games and a great time. ANNUAL BD's MONGOLIAN GUEST GRILLER EVENT! Raise money to support the 2014 Scholarship Fund. The Scholarship Fund will award deserving young people that show exceptional leadership skills and desire to persue STEM education and careers. The ticket prices include the tip and tax. We look forward to seeing you on APRIL 8, 2014 to watch our guests cook up your meal on our 2,000 pound, 600° grill !!!!!!!!!!!!!!!! Please see MONIQUE LAKE for tickets or see our website (www.nsbe-dae.org) to purchase your ticket from pay pal.